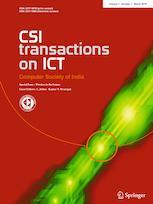 The journal CSI Transactions on ICT focuses on the practical implications of advances in information and communication technology and associated management issues. The journal serves domain experts in education, healthcare, management and agriculture who are working to utilize the vast potential of ICT in their respective fields and thereby bridge the digital divide. Economics, Practice and Management; and Computing and Computational Science.